May 12 is National Nutty Fudge Day. There is something special about the nutty fudge, and today you have a perfect excuse to indulge in this sweet delight. There are several stories floating around the creation of fudge. One of them refers to a letter by Emelyn Bettersby Hartridge, that was written in 1886 at Vassar College in Poughkeepsie, New York. She said, that her cousin had made fudge and sold it for 40 cents per pound in Baltimore, Maryland. Hartridge obtained the recipe and made 30 pounds of this treat for the Vassar College Senior Auction in 1888. Another legend tells about a young apprentice caramel maker who was stirring the pot while his boss was serving customers. The apprentice made a mistake and when the boss returned, the caramel was so grainy, that it was totally ruined. 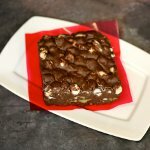 Nevertheless, the customers loved the treat and called it fudge after the name of the apprentice, who made it by mistake. There are even more stories about the invention of fudge, but don't waist time for it. Grab a box of your favorite nutty fudge with pecan or walnuts and celebrate the holiday with your friends, coworkers and family.